Fencing is an inexpensive way to really boost a home’s curb appeal. Whether you are preparing to sell your home and looking for ways to make it more enticing to prospective buyers or you are simply looking for ways to boost your dream home’s curb appeal, installing a beautiful brand new fence from Hercules Fence of Northern Virginia is a great way to do so. How can fencing add major curb appeal to your residential property and have everyone passing by turning their heads? Everyone knows that the stereotypically American fence is a white picket fence. It is used throughout popular culture to represent cozy hominess, and white picket fences are great ways to make your home look like, well, a home! White picket fences serve as particularly great complements to a garden, where the bright greens and pinks contrast with the white. 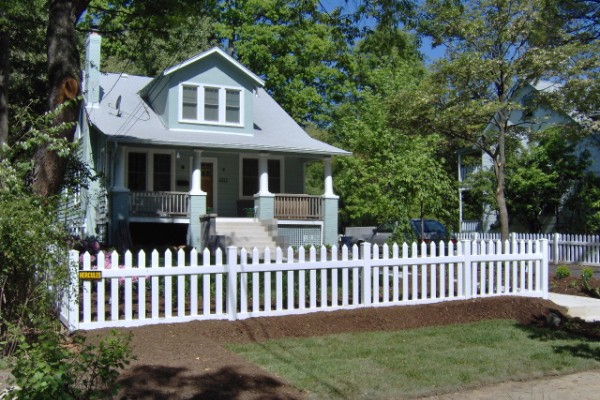 White picket fencing adds major curb appeal to homes that have a classic style, but they can also be modified to match a variety of design aesthetics. Picket fencing is not ideal if you want a maximum privacy fence. However, a white picket fence is a charming and gentle boundary marker that will definitely upgrade your home’s curb appeal. Wrought iron fencing is a timeless and elegant choice for many homeowners and business owners. It adds a touch of sophistication to your home, along with a great deal of curb appeal. More refined prospective home buyers will definitely be interested in your new wrought iron fence! Don’t think that you are restricted to classic black either—wrought iron can be painted many different colors to complement your home, including gorgeous deep greens. Lastly, if you already have a fence that is in great condition, consider painting or staining it another color to add some curb appeal to your home. If you like matching, consider painting your fence a color to match your new shutters or front door. For a contrasting look, play around with colors that match well with your home’s landscaping colors or with bright shades in accent areas or on certain panels. This entry was posted on Friday, October 14th, 2016 at 8:09 pm. Both comments and pings are currently closed.